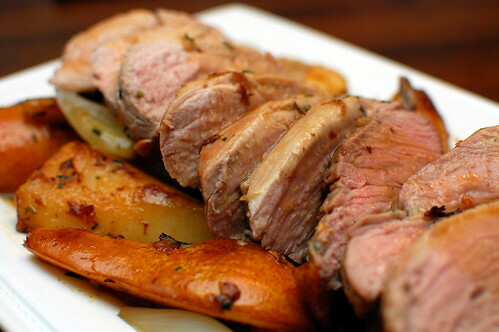 Other than chicken, pork tenderloin is the cut of meat we eat most often. I love that it is lean, cooks pretty quickly, and can be adapted to so many tastes and dishes. I also really love to pair pork with fruit. I just think the fruit brings out the natural sweetness from the pork, and the sweet and savory combo is one of my favorites. This particular recipe is great for so many reasons: it is a quick and easy meal, would be perfect for entertaining, and is fairly healthy. The sauce is finished with pear nectar, and it makes it seem so luscious and elegant. Preheat the oven to 475. Combine the oil, garlic, 1/2 teaspoon kosher salt, 1/4 teaspoon pepper, and thyme in a small bowl. Toss half the mixture with the pears and shallots, and rub the other half over the pork. Heat a large ovenproof skillet over medium-high heat. Add the pork and shallots. Brown the pork on all sides, about 7 minutes total, and toss the shallots occasionally. Transfer the shallots to a platter, and transfer the pork to a baking sheet and place in the oven. Bake until an instant-read thermometer reads 145, about 8-12 minutes. Meanwhile, using the same skillet, saute the pears over medium-high heat, turning once or twice, until browned and softened. Transfer the pears to the platter. Mash the butter and flour together in a small cup or bowl. Add the white wine to the skillet, and cook, scraping up the browned bits. Add the chicken broth, pear nectar, and pear nectar to the same skillet. Boil until sauce thickens, and season with salt and pepper. After pork has rested at least 10 minutes, slice and arrange on the platter with pears and shallots. Drizzle sauce over the platter, and serve with additional sauce if desired. the recipe looks great, but i think there is a typo int he second to last paragraph: "pear nectar, and pear nectar"
I made this tonight and it was excellent! It took about 12 minutes to roast the tenderloin at 475 and it turned out beautifully. Don't be afraid to be liberal with the pepper, since the effect of the pear jus was quite mild. The braised pears were my favourite part.